The completely natural cork used in manufacturing ProtectoMat® and GrafixMat® cork products originates from cork that is "harvested" in Spain and Portugal. Cork is actually a layer of dead cells that accumulates on the surface of the bark. 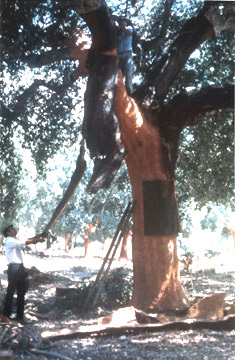 We say that cork is harvested because it is removed from the tree with no damage to the tree or impact on its growth. The tree produces its first harvestable cork when it is 30 to 40 years old and will produce a 2-3 inch layer of cork every 7 to 10 years during its 200-year life. The slabs of natural cork removed from the trees are cut into small cylinders that are used to cork wine bottles. The remaining pieces of cork are then sized and -- in some products -- toasted to various degrees to produce the color variations that make the product’s surface truly unique. Once toasted, the cork is combined with a pliable adhesive, compressed and cured into large blocks. The blocks of cork are sliced into sheets and sanded smooth. These large sheets of cork are then laminated to superior quality hardboard and sized into ProtectoMat or GrafixMat products. Cork is one of nature’s most beautiful and unique materials. 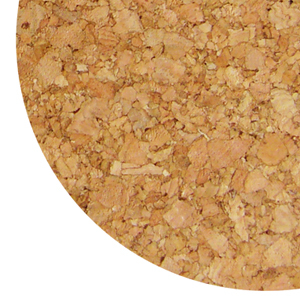 Cork is natural, environmentally safe, recycled and recyclable!